You can read my full book review here. 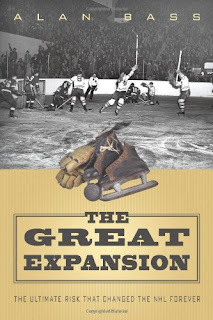 Below you will find an interview with the author, Alan Bass, regarding NHL expansions and his book. Enjoy! Q. 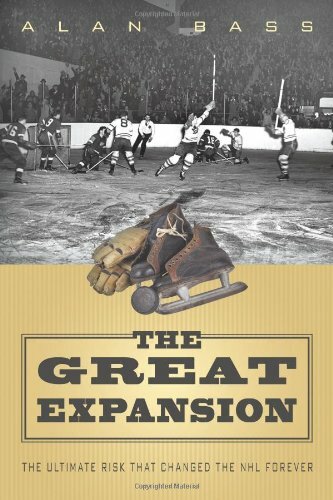 Was the NHL's expansion in 1967 the most important event in NHL history? In my opinion, yes. Twenty or 30 years down the line, we might be throwing the 2005 lockout up there, but for now, there is no event in the league’s history that had such a crucial impact on the NHL. In fact, in The Hockey News’ special issue on moments that changed the game, 1967 expansion was ranked number one, above such crucial events such as the lockout, Wayne Gretzky and Bobby Orr’s respective arrivals, the WHA debut and collapse, the goalie mask, and more. The implications of expansion were so vast and important to the current health and financial success of the NHL. I could go on for pages about the importance of it. That’s why I believe it was so crucial to cover this event and secure its spot in history with this book. Q. The NHL had just six teams for the better part of three decades. Why did it take so long for the NHL to expand? The league was very successful for decades. They were filling their arenas to about 95% capacity, and the hockey was great. If you watch games from that era, they were just incredibly exciting. Almost every player on every team had the talent to score goals, there was little dirty play, and almost no hooking and holding like you saw after ’67 expansion. Q. Was there any objection amongst existing NHL teams concerning NHL expansion? Q. It was not as if there was not strong hockey teams and markets in the WHL and AHL. Was there ever any consideration to expanding into these markets prior to 1967? Q. Some things never change - how much of a role did television play in the NHL's desire to expand. Television played a fairly big role in the league’s expansion. The Original Six owners were already wary about putting their game on TV, because they thought it was going to decrease gate revenues. However, with the league already playing to about 95% capacity, many believed that TV was the only way they were going to be able to compete with the other major professional sports leagues. As far as expansion goes, it was arguably the deciding factor, because they were very close to not being offered a contract at all. In fact, in a meeting with the NHL, one TV executive told them that until they expanded, they would have as much of a chance of landing a TV contract as the fledgling Western Hockey League. One of the stipulations of a tentative TV contract that they were offered in the mid-’60s was that a team had to be expanded to the Bay Area of San Francisco – a huge TV market. Of course, expanding to five other U.S. markets didn’t hurt their cause, either. Q. Your book goes into great detail about the ins and outs of the expansion strategy - Can you give us a quick run down as to why the NHL picked the 6 cities they did? Most of the cities chosen had long histories of hockey success. St. Louis received a team without even applying, because Bill Wirtz owned the St. Louis Arena and wanted to get rid of his share in it. Barry van Gerbig, Oakland’s eventual owner, was good friends with Bill Jennings, and had good financial backing from numerous investors (plus, CBS wanted a team in the Bay Area). Jack Kent Cooke, the Los Angeles Kings’ owner, was a Canadian who already owned the NBA’s Lakers and had a great love of hockey. Pittsburgh’s bid was helped by Pittsburgh Steelers’ owner Art Rooney, who called the Board of Governors and insisted the NHL accept the city’s bid. Their owner was also going to be Pennsylvania state senator Jack McGregor, which helped the league get “in” politically. Minnesota had recently built a $6 million stadium across from the Minnesota Twins’ ballpark, and was expected to bring in great deals of revenue for the league. Philadelphia was more unexpected by the media and fans, but the owners were impressed with the tentative Philadelphia owners’ willingness to build a multi-million dollar arena in their sports complex. As we can all see, they were arguably the most successful of the six. Q. In Canada there were a lot of people upset that Vancouver did not immediately get a team. Why did they not? Vancouver felt that they were almost guaranteed an NHL franchise, so when the league’s announced plans did not include a team in British Columbia, they claimed they were robbed of NHL hockey. They had extremely successful minor league and junior teams. They had the money, and they had the fans’ backing. However, the league claimed that if Vancouver were to be granted an NHL franchise, no one would own more than 10% of the team. There also seemed to be no one person that controlled the team or was the head of the organization. Clarence Campbell even said outright that it was simply not a good situation. People in Vancouver claimed that Campbell didn’t even give the city a chance, but that has not been proven to be true. Plus, they got a team a few years later, so it worked it for everyone! Q. What other cities were considered but did not make the cut? Q. How successful was NHL's expansion in 1967? Extremely successful – arguably the most successful decision the NHL ever made. Although one of the teams relocated (Minnesota) and another no longer exists (Oakland/California), 1967 expansion really allowed the NHL to spread their game to the national level and increase their exposure. If the NHL waited another decade or so to expand, their sport would not be nearly as widespread as it is today. Of the six teams added, five of them still exist, and all five have at least participated in a Stanley Cup final, while two (Penguins and Flyers) have won Stanley Cups and are among the most successful in the league, both competitively and financially. The Great Expansion also led to multiple more expansions, throughout the 1970s, and up through the turn of the century. It’s almost unimaginable to think what the NHL would look like today if the league didn’t expand in the ’60s. Q. In your mind, how successful has Gary Bettman's expansion strategy in the 1990s been? To an extent, it’s been successful. The object of expansion is to grow the game, and for the most part, he’s succeeded. Many people like to second-guess the NHL front office and claim that they know more than people like Bettman, Bill Daly, Colin Campbell, and more – and that’s simply not true. If you go through the teams – San Jose, Ottawa, Tampa Bay, Anaheim, Florida, Nashville, Atlanta, Columbus, Minnesota – almost all of the expansion teams have been successful. Only a few of them have allegedly struggled financially, but you simply can’t expect teams in the Sun Belt to have the revenues of the Maple Leafs, Canadiens, and others. It’s like expecting a fifth grader to be able to do calculus – it’s possible, but not probable. The NHL is enjoying record revenues and record profits. The on-ice product has never been better. Their popularity is rising and close to catching that of the NBA. The league is doing it right, and if they continue to do so, we could see this league skyrocket. Q. Do you think we will see another NHL expansion any time soon? I doubt we will within the next 10 years. The only reason the league expanded in the past is because their existing teams were all close to selling out and there were few other options to increase revenues. Right now, however, we’re seeing a mix of teams that are allegedly struggling. With the situation currently going on in Phoenix, mixed with a few teams supposedly up for sale, and others that simply aren’t selling enough seats, there’s going to be some time before the Board of Governors decides it’s time to add more teams. It really annoys me when, every time word comes out that Gary Bettman or Bill Daly are meeting with an interested owner in Quebec City or Kansas City or Hamilton, fans and media say that the league is “definitely going to expand.” Bill Daly has said multiple times that the league is only going to consider expansion once they are certain that all of their teams are financially healthy. Right now, that isn’t the case, so we can’t expect expansion to occur in the near future. But if everyone trusts the league and their decisions, we might see the day, maybe close to 2025, where perhaps the Quebec Nordiques or the Winnipeg Jets make a return to the NHL via expansion. I picked up this book and i'm really enjoying it. The only negative thing that comes to mind are some bad chapter decisions. In the draft he goes round by round telling about every player in paragraph after paragraph. I think a chart would of sufficed much better. Also in the specific team chapters he seems to go game by game many times but he does skip through to speed it up so it's not nearly as bad. Overall all though, a good first book for Alan Bass. Overall the book is great, especially the first few chapters. I think some of the material toward the end of the book was a bit disorganized, especially the chapter on NFL and MLB expansion -- its relevance to the rest of the book wasn't clear and it seemed like a bit of an afterthought, with a lot of typos. "The results of the study show that the teams with the most playoff success — Montreal with 5.7 playoff wins per year, Colorado with 5.6, Edmonton with 5.4 and Dallas with 5.0 — have never been in serious danger of folding or relocating and for that matter have never had severe financial problems." I thought that both Edmonton and Montreal had very serious financial problems, especially when the Canadian dollar was at its historical lows. Perhaps he meant that they never had severe problems while the team was winning.